Typically, I’ve not been an advocate of defragmenting hard drives in Macs—OS X has a decent built-in defragmentation feature, and quite honestly, most Macs don’t stay in my possession long enough to have their drives become seriously fragmented. However, my 12-inch PowerBook G4 is an exception—this machine has been in the household directly since April of 2004 (and indirectly before that; it replaced a previous-generation 12-inch PowerBook). Lately, though, the little machine has been quite sluggish—lots of spinning rainbows, and very slow application launch times. Given the testing abuse I put the machine through (I install and delete tons of stuff, and test many apps and hints on it), I thought it was possible that a badly fragmented hard drive was responsible for the slow performance. So I fired up a drive defragmenter, and let it churn away. Eventually, after many many hours, it finished. When I rebooted, though, I got nothing more than the gray screen. Figuring something had gone astray in the defragmentation, I booted off the OS X 10.5 DVD to reinstall OS X. When the installer told me it couldn’t reformat the drive, I was pretty sure I was in trouble. I really like the iFixit guides, as I find them easy to follow and well illustrated. Having never ever cracked the case on the PowerBook before, I wasn’t quite sure what I was getting into, but the guide allayed most of my fears. I read through it completely before starting, and would recommend the same for anyone contemplating such a do-it-yourself project. The guide tells you exactly which tools you’ll need, too—although in the case of the 12-inch PowerBook, I would add “small needle nose pliers” to the provided list. I found them invaluable for both picking up the tiny screws after I loosened them, and for making sure I was disconnecting the various cables by pulling on the connectors and not the cables. The actual disassembly went better than I had expected, though it took about 35 minutes to get to the hard drive. There are just a lot of small screws to remove—36 in all—and I wanted to make sure I didn’t drop any, either into the machine or onto the floor. The scariest part of the disassembly comes right up front, when you have to remove a few keys from the keyboard to get to two screws. It really seems like you’re going to snap the keys in half as you pull up their left edges, but eventually, they will pop free. After that, it’s just a matter of removing screws in the right order and storing them in the right place (more on that later). Separating the case was a bit challenging, but nothing like trying to get into an iPod or Mac mini, both of which I’ve done before. 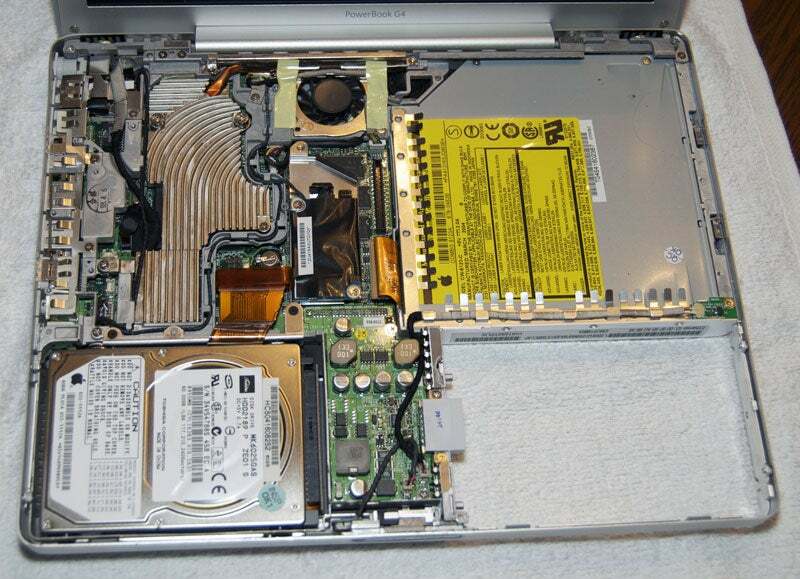 At right (click the image for a larger version), you can see my new homemade version of the MacBook Air. It’s a very light machine, but typing is quite difficult and you’ll need a power cable, as there’s no battery. Like the Air, though, my machine is all about tradeoffs! That picture is, of course, what the disassembled PowerBook looks like, just prior to hard drive removal—that’s the hard drive in the lower left corner. The screws that hold the PowerBook together are not only tiny, but it seems that they’re almost all of different shapes and sizes. So you not only need to find all 36 screws to put the machine back together, but you need to get the right screw into the right hole. The best solution, I believe, is to use either ice cube trays or empty egg cartons to hold the screws you take out in each step. Use a small piece of paper to note at which stage of the assembly each compartment’s screws go back in, and you’ve got a pretty good system. Our home, of course, was lacking in both egg cartons and ice cube trays, so that plan was out. 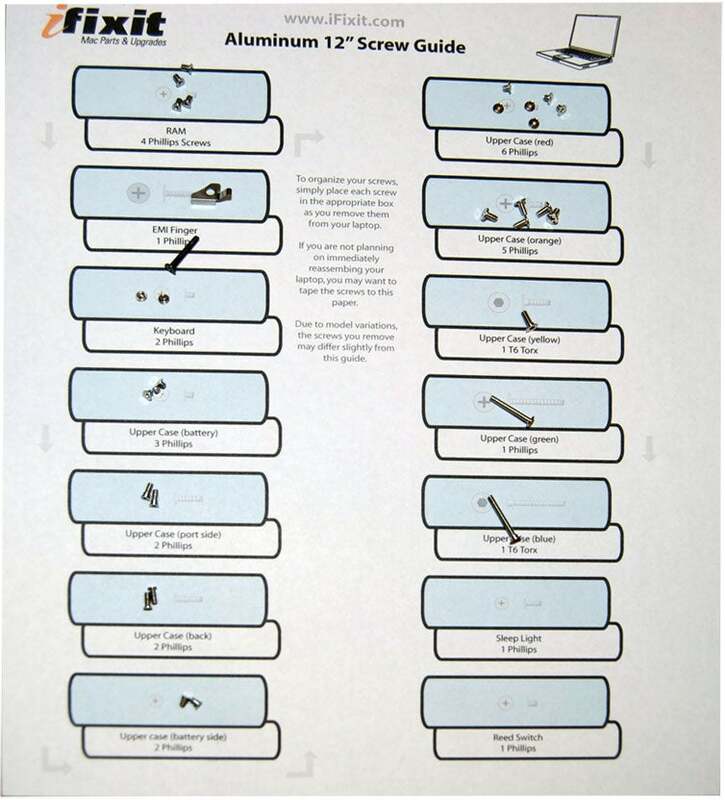 Instead, I relied on the iFixit guide’s “virtual” screw sorter, as seen in the image at right (click for larger version). Each page of the sorter has a number of colored boxes, labeled based on what screws are taken out at each step of the process. Just put the screws “in” the proper box as you take them out, and reassembly is a snap, er, a few hundred turns of the screwdriver. The main danger here, of course, comes from house pets or humans who may bump your disassembly table, sending your nicely organized screws across the room. For added safety—especially if you’ll be working on this project over a couple of days—I suggest taping the screws down to each slot on the paper. Alternatively, just buy a couple ice cube trays before starting such a project! After pulling the old drive, the reassembly process went relatively smoothly. If you use the iFixit guide, you’ll find you’re on your own after you remove the hard drive—that’s where the guide stops. To make sure I went in the proper order for reassembly, I used the guide again, but started on the last page and worked to the first page. During reassembly, the only really scary bit came when it was time to put the dozen or so screws in place under the keyboard. There are a number of holes in this panel, and dropping a screw through one of them would have meant ripping everything apart again to find it. Thankfully, there weren’t any incidents, and the machine was soon bundled up and (hopefully) ready to go again. Total time, from start to finish, was just over an hour (allowing for some time to go find the pliers and a better Phillips-head screwdriver). So did it work? Amazingly, to me anyway, it did—when I rebooted with the OS X install disc, the installer saw the new drive, Disk Utility formatted it, and the OS X installation went smoothly. My treasured 12-inch PowerBook has returned to full health, even better than it was. As a completely unexpected side benefit, the machine’s sleep light started working again, too—it had stopped some months ago. Somehow, during the drive installation process, it returned to life. For anyone contemplating a similar hard drive replacement, I’d generally say I found the process easier than I was expecting. That doesn’t mean there aren’t dangers—if you break a connecting cable, for instance, replacing it won’t be much fun. If you’re going to do this, though, make sure you’ve got a current backup (if possible), the right tools, a good assistance guide, and the time to get the job done. Of course, if your machine is under warranty, don’t do any of this—take it to Apple instead, and let the folks there sweat the details!